This post is by contributing writer, Bethany Wright of WoodhavenPl.com. I’m the type of person who loves setting goals. I think that’s why I’m so drawn to Katie’s baby steps – they are tangible ways to make resolutions and goals come true. Now I know this time of year it’s all the rage to make resolutions – just as it seems to be all the rage to mock making them. But since I like setting goals/resolutions, it felt appropriate that I should share mine with you. To make it look NOTHING like last year. May I share a little bit of my personal story? As I think over this past year – learning how to live with chronic sickness – I realize that this is not a season of life I would wish on anyone. The hardship and the struggle was real. I felt a shadow of myself. It was during this time that a friend convinced me to purchase an Instant Pot. She said it would change my cooking forever and make life my life easy. I’m not one to jump on fads or believe hype, but I eventually caved. I had absolutely no idea how to unbox and set up my Instant Pot, so I let it sit in the closet for two months. Finally, another dear friend came over and showed me how to use it. 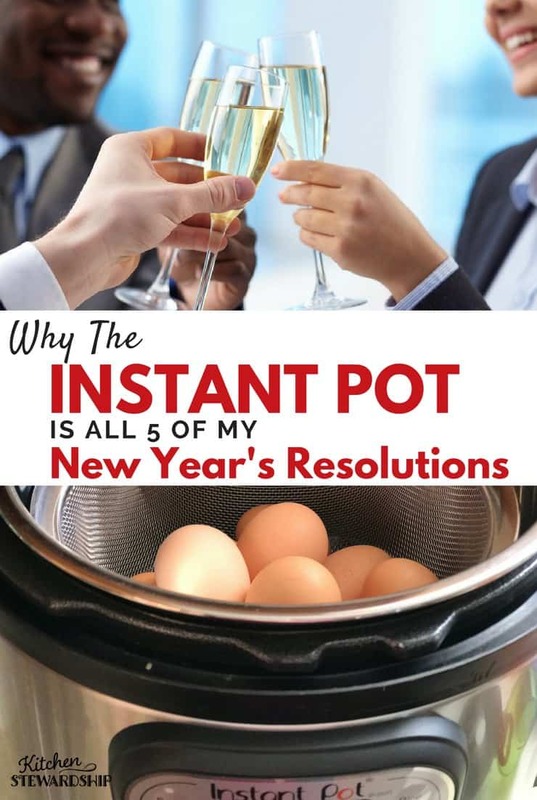 Not familiar with the Instant Pot? It’s an electric, programmable pressure cooker that sits on your counter. It cooks food QUICKLY, making delicious roasts and fantastic whole chicken. It can cook your meat from frozen, including cooking frozen ground beef – no thawing or sautéing required! I make hard boiled eggs in two minutes and delicious, gelatinous bone broth in one hour (instead of 12-24 hours). Don’t let your Instant Pot sit in the box! Check out my step-by-step tutorial on how to set it up. 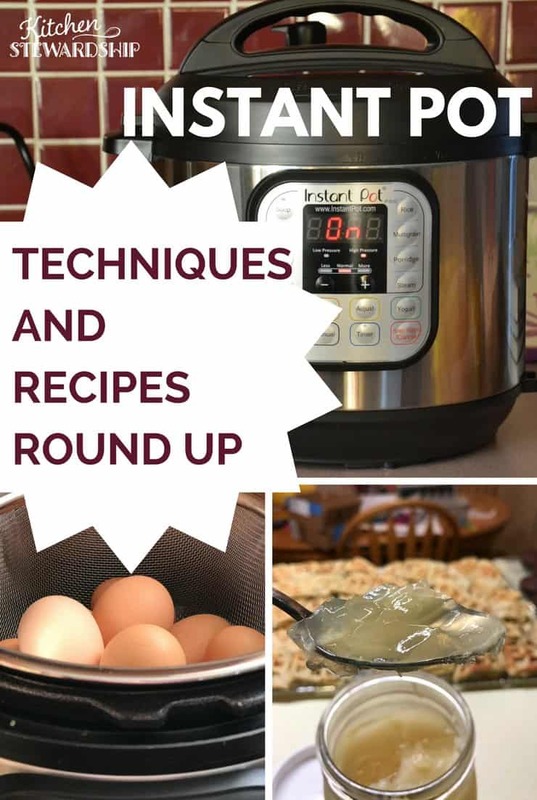 Grab my personal Instant Pot recipes, as well as my tips for traveling with the Instant Pot and how to make Instant Pot freezer meals. You’ll definitely want to read these 10 basic Instant Pot Techniques. Be sure to grab all the Kitchen Stewardship Instant Pot recipes here, including a round up of ten easy dishes anyone can make. If you really want to take your Instant Pot cooking to the next level, consider taking this incredible Instant Pot cooking eCourse that even teaches you how to warm up leftovers in your Instant Pot! As I began learning new ways to cook, the Instant Pot became my gift from above. My interest in cooking revived. Words cannot describe that gift! I was actually able to cook for my family again! I was finally healing – physically, emotionally, mentally, spiritually – and coming up for air. And then, my dear sweet family – who had been faithfully treading water during my year-long health crisis – began to sink. My husband had his final semesters of Master’s classes and the busiest travel schedule in our ten years of marriage yet. His punishing schedule sucked the life out of him. Both our children were also diagnosed with Celiac disease – and on some levels, their diagnosis was even more concerning than mine. The ramifications of their Celiac disease touched every aspect of our lives. Suddenly we found ourselves plunged into a world I knew nothing about – pediatric hospital visits, autism screenings, blood draws, x-rays, physical therapy, orthotics, twice-weekly occupational therapy, speech therapy, hearing tests, and more insurance paperwork than I could possibly imagine. As I’ve been walking through this new season with must-survive-tunnel-vision, it dawned on me that my resolution to make this year look nothing like last year was flawed. I can’t predict the future and I have no idea what God may plan. So rather than focus on the things I can’t control, I’m focusing on the things that I can. And I never suspected what would be right at the center of those goals. Meet my Instant Pot. 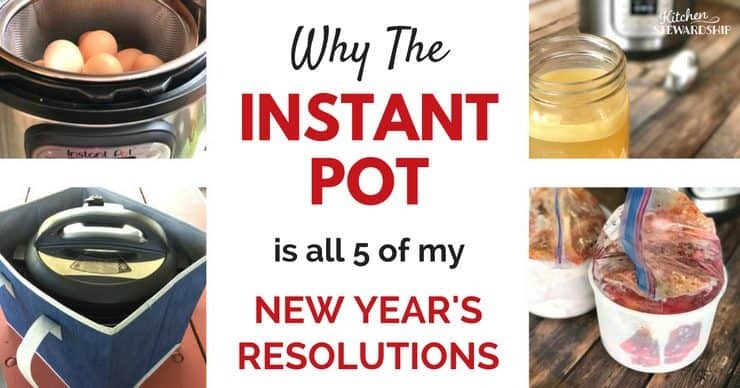 As I looked at every goal I want/need to attempt this year, I was surprised how many of them involved my Instant Pot. We are now facing an onslaught of monthly medical bills that we’ve never had to account for. Until this year, we set aside maybe $15-20 a month to cover the random once-every-six-months doctor visit. Now we are spending as much in medical bills as we do for our food budget. Every dollar needs to stretch. Previously, we spent quite a bit of money buying lunch meat, sausage links, canned meat, and other healthy convenience foods to survive. But when you compare price-per-pound, I was spending close to $10/pound purchasing these ready-to-eat meats. I was making the MOST expensive meats my go-to meats – which was really hurting our budget. Rather than relying on beef hotdogs or turkey lunch meat as my go-to quick lunch option, I’m using ground beef and ground turkey instead. But since I still don’t have much time, I need to be able to have it cook without having to thaw it, brown it, OR take the time to stand over a stove. The Instant Pot makes that happen (check out how). I’ve also tweaked this method for making my own meaty spaghetti sauce (again, no watching the stove or sautéing), using frozen ground beef. I love that I can start my meaty spaghetti sauce in the IP, dash out the door to therapy, and come back to dinner being ready – with no stove top effort from me. When it comes to budget-friendly vegetables, we bake sweet potatoes in the IP (15 minutes!) and roast squash in just 8 minutes. Another budget-saving IP recipe includes this meatless Mexican Lentils and Rice dish. Although we can’t eat oats (such an economical breakfast! ), the IP is famous for making amazing hassle-free oatmeal. 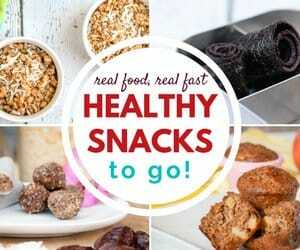 I am also following Katie’s tips on how she slashed her grocery budget and how to stay frugal while eating real food. Update! One of my (Katie’s) dear friends just opened a massively comprehensive budgeting course that’s ALL about real food – not a coupon in sight! Check out Grocery Budget Bootcamp before registration closes next week! When we met with the nutritionist about our Celiac disease and nutritional deficits, one thing we realized was that we were not consuming NEARLY enough protein or iron. One of the most economical ways we are squeezing meat into our diet is by cooking whole chickens. I made learning how to handle a whole chicken my resolution a few years ago. The Instant Pot takes my method for cooking a whole chicken and makes it even easier. A whole chicken (with tender meat) cooked in thirty minutes? YES PLEASE! In order to help boost our iron levels, we are eating eggs more frequently. We buy farm-fresh eggs from a local friend. But PEELING farm-fresh eggs has been the BANE of my existence. In college, I would boast in the cafeteria about how I could slip the shell off of a hard boiled egg in one piece. Conventional kitchen wisdom says you should boil your oldest eggs, so they are easier to peel. But farm fresh eggs are notoriously hard to peel. I’d be lucky to have much white left! The Instant Pot completely changed that. The Instant Pot makes this process INSANELY easy. It steams the eggs. And the shells – even on freshly laid eggs – fall right off. I follow This Old Gal’s 2 minute method for hard boiling eggs. I set the program to run and I walk away. I don’t have to worry about rescuing the eggs after a certain time because they do fine hanging out on the Keep Warm setting. The best part? NO ICE BATH NEEDED. Seriously. 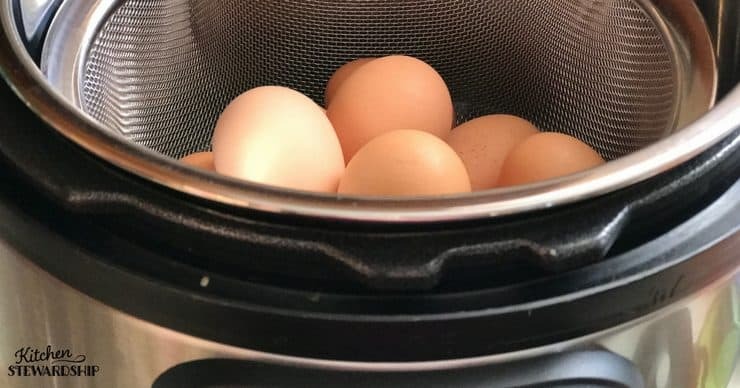 I can now confidently hit my goal of making hard boiled eggs every week. Healing our guts is a Number 1 priority right now – and we’re using nutritious bone broth to help. Kitchen Stewardship has ALWAYS been big on bone broth – in fact, it’s one of our first baby steps! My old cooking method involved using a slow cooker and took HOURS to make. I’d let the broth simmer for 12-24 hours, depending on my schedule. The result was some nutritious broth…but I definitely had to plan in advance. The Instant Pot makes delicious bone broth in one hour. And it’s just as gelatinous and nutritious as the one simmering for 24 hours. I used to worry about keeping frozen (or self-canned) broth on hand. And I still keep some for emergencies. But a one-hour cook time is so stinking fast that I’m able to make it when I need it without too much forethought. 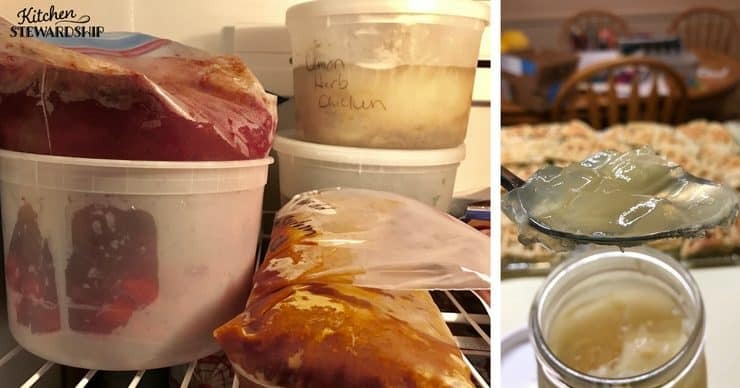 Honestly, it’s really easy to make bone broth in the IP – which is probably why there are a gazillion Instant Pot bone broth recipes on the internet. But in case you need it, here’s my personal recipe to get you started. I always knew time was precious; now it is also scarce. This week alone, I’m spending 6.5 hours at various therapy locations for my kids just this week. That doesn’t include transportation time (hours!!!! ), doctor visits, school, or other weekly commitments. If I want to survive, I have to be wise with my time. I’m getting up earlier in the mornings – before the family wakes – to grab my computer time. When my kids get up, I want to be able to give them my undivided attention. I’m also learning how to schedule and work on the go, making the most of those tiny pockets of time. It’s time for me to bust out my FlyLady skills and her 15 minute cleaning routines. On top of our daily homeschool work AND daily occupational, speech, and physical therapy assignments, I also want to spend more time reading aloud to my kids. Make your Instant Pot work for you! The Instant Pot has gotten a lot of hype over the last couple years – for good reason. It really can do just about anything. Although it can seem a bit daunting to use at first, it really becomes quite simple once you give it a try. Use the techniques, tips and simple recipes from the Instant Pot Guidebook to get started, and before you know it, your Instant Pot will become indispensable! Get the Instant Pot Guidebook for FREE! Time is finite, and the sacrifice of time shows most evidently in the kitchen. So I’m utilizing freezer cooking to the fullest extent. Every few weeks I’ll take an hour or two to assemble multiple freezer meals. 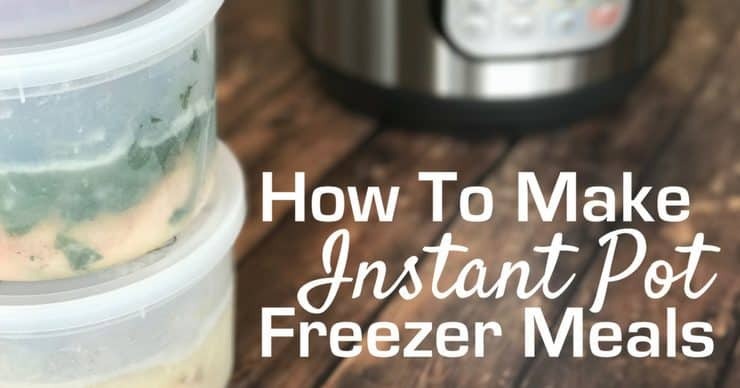 The IP is FANTASTIC for freezer meals because the Instant Pot can cook meals directly from frozen — no thawing necessary!!! There’s no need to stir, preheat, or watch a pot. If I step out of the house, I know it is safely cooking – and will switch to Keep Warm when I’m done. You should know that not everything cooks faster in the Instant Pot. However, the CONVENIENCE factor is a lifesaver. Have I mentioned I love not worrying about pre-heating my oven and timing my dinner? The freedom to step out of the kitchen and focus on my family is inexplicably wonderful. I’m hooked on freezer meals. Our partner, Once A Month Meals, has IP freezer menus. They also have a plan with Katie’s mini menu providing 2 weeks worth of meals! If you’re looking to start freezer cooking or need to change up your freezer cooking menus this is an incredible resource! As we return to feeling better, pursuing our passions – cycling and traveling – are becoming a priority. Of course, in keeping with Resolution #1, we will need to make our travels extremely budget friendly. We try to utilize a lot of camping. However, eating out with Celiac disease is ridiculously challenging. I’m not a huge fan of spending hours in the bathroom on vacation, so we have to bring our own food with us. I used to travel with a slow cooker, electric skillet, and rice maker (oy vey). Thankfully, the Instant Pot replaces those three appliances! Now, the Instant Pot travels with me everywhere. I’ve cooked in hotels, lodges, and camping cabins. At the time of writing, the TSA allows you to take pressure cooker on an airplane. Check out experiences people have had here and here. I’ve learned all sorts of travel strategies with the Instant Pot. Don’t let your Instant Pot sit in the box! Do you have New Year’s Resolutions? How has the Instant Pot revolutionized your life? We’d love to hear your personal story in the comments below! Just started using my instant pot yesterday. Tonight Im using one of Katie’s recipes for lemon curry chicken. If the chicken isn’t quite done it says to put it on for another 5 min on manual at high pressure, but will that take another 25 min to cook it because you have to wait for 20 min to get to high pressure plus the 5 min? Thanks! Utterly great article. Really, an opening chapter to a book’s worth of links! Thanks! Im sending this webpage all over the country to ppl. I hope you are already doing a lot better health wise. I have done research on quite a few things that may relate to your health problems. I used to have chronic fatigue, insomnia, liver problems, food intolerances and some other issues. I can leave a link to my blog or you can contact me if you like. Quinoa porridge has been a great oatmeal substitute for us. I cook it in half almond milk half water. And throw in dried coconut for a bonus. It’s fab. I am sorry to hear that the struggle is real for you! I really want to thank you for this post. I just got my IP and didn’t really know where to begin, but your post is like a goldmine and a road map all rolled into one. I’ve only tried a couple of easy things, but I’m so encouraged. I’ll be sharing it to my friends for sure.